Market Rasen twin racers Tim and Tom Neave had to battle through tough conditions at a wet Oulton Park last weekend. They were competing in their respective championships where Tom was 18th deputising in the British Superbike race, and Tim 19th and eighth in his two Superstock 1000 races. 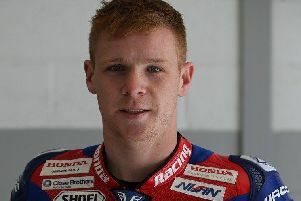 Tom was deputising for a second time for the injured Chrissie Rouse aboard the Halsall Racing Suzuki in the British Superbikes, and completed his qualifying in 21st place for a seventh-row start to the first of two races. The rain poured down as the riders took their grid positions, and as the lights went out, the spray made visibility very difficult for the opening laps. Once the field had settled into the race Tom moved up into 18th which he held throughout the 16 laps, and although not in a position to score championship points he did complete the race. The rain stopped in time for the second race, and the track was dry, but despite a good start, Tom crashed out on the first lap, his race over before it began. With Rouse due back in the team for the next round, Tom is set to return to the Superstock 1000 class for the final race of the season. Tim, meanwhile, was completing in the Superstock 1000 class for a second time, but crashed out of the first free practice session on Friday which put him on the back foot. He struggled during qualifying and began his first race on Saturday from the 11th row. Starting so far back made it impossible to make up the ground into a points-scoring position and he crossed the finish line in 19th, having gained 14 places during the race. Starting race two on Sunday from the seventh row in wet conditions, Tim got off to a great start and made up five places on lap one. By lap four he was up into 12th and at the halfway stage of the 14-lap affair he was 11th. Two laps later he was up to ninth and on lap 11 he passed Matt Truelove for eighth position. Billy McConnell was too far ahead to catch in the remaining three laps, although Tim did cut the deficit to just over six seconds at the flag. The eight points brought his total to 20 from just two rounds, with the final race at Brands Hatch over the weekend of October 12 to 14.